No matter your towing, roadside assistance, or asset recovery needs, Collins Towing and Recovery offers the best tow truck service in the Statesboro and SE Georgia area! We are a service providers for several roadside assistance companies. Our flatbed and wheel-lift tow trucks provide damage-free tow service for any light-duty needs. Our trucks handle anything from motorcycles to 4x4 pickup trucks and large SUVs. Whatever your light duty towing needs, call Collins Towing and Recovery today! Our single axle tow truck is great for large delivery trucks and single tractor units. 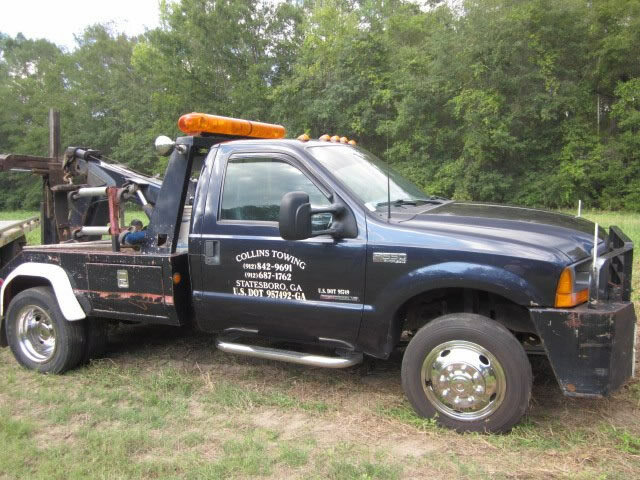 At Collins Towing and Recovery, we have fully-equipped trucks, and highly qualified drivers. So, you can rest assured your small box truck or small motor coach will be safely towed in an efficient manner. At Collins Towing and Recovery, we understand that life gets hectic. Accidentally locking your keys in your car can cause distress, and put a damper on your day. That is why we offer fast, friendly and reliable lockout services. You can call our expert locksmiths at any hour of the day (or night) for your automotive lock outs. At Collins Towing and Recovery, we offer the finest in asset recovery services. We maintain a fast, professional, and effective manner throughout the repossession process, so you can rest assured your assets are recovered in the best condition possible. This is why more and more lenders now use Collins Towing and Recovery for fast, effective return of their assets. Recognizing an ever-increasing need for private party repossession services, we act, and act fast for the successful return of your collateral. Whether you are in need of skip trace services to recover a company car, or need assistance in enforcement of a divorce settlement with an uncooperative spouse, our Private Party Repossession Services are the most effective, and professional repossession services in Southeast Georgia.